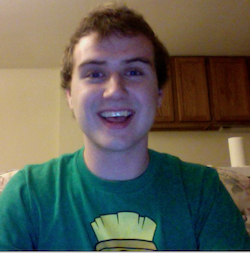 My name is Mike Coakley, and I’m a senior here at UW majoring in History (US) and Comm Arts (Radio, Film, TV). Im from Milwaukee, where I worked at a music store called Nova Musik this past summer. I also worked on the weekends doing the lights at 2 clubs in downtown Milwaukee. I transferred to UW my sophomore year and actually spent my freshman year at Columbia College in Chicago for audio arts. In my spare time I like to mix and make music. I love biking but unfortunately my bike essentially fell apart this past summer and I have not replaced it yet. I spend too much time on the internet and I think that for obvious reasons, knowing how it came to be is important. I once typed an entire lecture of CA351 Lyk3 tH1$.